Everything seems to be available to the DIY crowd these days, even vinyl car wraps. With a quick browse on the internet, wrap lover can find their own DIY vinyl wrap kit and get going on their wrap job. However, is this really a good idea for the inexperienced wrapper? Vehicle wraps are part of a delicate process and there are many mistakes that can be made. Here are some of the biggest ones that we have seen in the past. Sure, you know your car well, but do you know it well enough to get the exact measurements needed for your vehicle wrap? Improper planning and measuring can end up leaving your car looking like a mess rather than a masterpiece. There is a whole equation involved in measuring your car before purchasing your vinyl, and the average person is bound to have a difficult time figuring out how much vinyl they actually need for the job. Remember that your vinyl material can stretch, but can also be stretched way too thin. 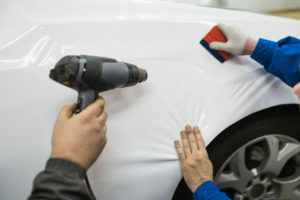 One of the key elements in your vinyl wrap is the glue that is heated up to stick to your car. By overstretching your wrap, you are severely thinning out the glue. One of the main questions that most DIY wrappers ask is with regard to how hot the heat gun needs to be. New wrappers get so wrapped up in measuring the temperature of their heat guns that they forget that they really need to be looking at how the wrap is sticking to the car. If it is your first wrap, we suggest using a hairdryer at its lowest setting. After a couple of minutes, if the material has no relaxed, then slightly increase the heat. Keep repeating this process until you have reached the desired temperature. Many first-timers try to save money on their wrap by cutting the material before placing it on the vehicle. While this system can work, it is a risky one, and you easily put yourself in a situation where your car’s wrap job looks extremely patchy. The biggest mistake you could make when deciding on your first wrap is to do it yourself and not hire a professional wrap team. A team like the one present at SkinzWraps, Inc. will be able to tell you exactly what your car needs for the right price. Your car wrap is an investment, so putting your investment in the hands of professionals is really the best decision that you could make. If you are thinking about getting your first vinyl wrap on your car, don’t try it at home. Contact SkinzWraps, Inc. today to find out more about our services and how we can help you.